You are here: Home / Lifestyle / Advice and Tips / Are You an Overachiever or an Underachiever in Your Work-at-Home Life? Do you jump on a freelance project as soon as it hits your desk? Do you meticulously evaluate every project that comes to you so much that you don’t get started? Then you are either an overachiever or an underachiever, respectively. However, both of them are on equal footing, and both of them can work at home successfully. According to Alice Bredin, author of Virtual Office Survival Handbook, the secret is to know what your tendencies are and how to work with them. 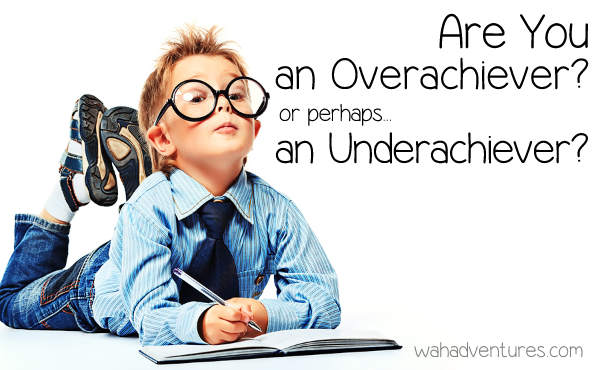 Why Label Someone Working at Home as Either an Overachiever or an Underachiever? While there is no need to put anyone into a category, there is the need to know which one you have more characteristics toward, so as to help you develop a work-at-home (WAH) style that will help you be successful despite leaning more towards one than the other. Knowing that you are an overachiever will help you not to be too ambitious and take on too much work leading to burnout. While recognizing that you are an underachiever, will help you become more confident in what you are doing, and help you shy away from being such a perfectionist that you never really do get started with anything. How Can I Know That I am An Overachiever? Also keep in mind that very few people are completely 100% an overachiever or an underachiever. It is important to know which one you are more like. When someone asks me to try something new, I am excited because I love change and new things. When someone criticizes my work, I assume the criticism is valid and work harder next time. When I have an idea, I take action on it immediately. When I plan my days, I like for my days to be fully booked. When I finish a project early, I start working on the next thing on my to-do list. How Can An Overachiever Successfully Work From Home? having set hours instead of trying to do a daily marathon. taking new projects and plan how and when to achieve them. scheduling time for friends or family. setting goals with a friend or trusted colleague who will steer you against not doing enough. learning to delegate small tasks to free up your time. evaluating whether you are using your time wisely or just hiding behind “busy-ness”. streamlining your business and have it in alignment with your career and financial goals. How Can I Know That I Am An Underachiever? When someone asks me to try something new, I tend to shy away from new challenges or change. When someone criticizes my work, I feel offended and cannot continue working until I “recover”. When I have an idea, I think about it quite a bit but don’t take action until the timing is perfect. When I plan my days, I like don’t like too much structure and must plan for free time as well. When I finish a project early, I celebrate by watching television or finding another distraction. How Can An Underachiever Successfully Work From Home? learning to handle rejection and failure. breaking down big goals into smaller ones. finding ways to stop procrastinating. realizing it’s okay to make mistakes. Well, Am I an Overachiever or an Underachiever? Where did you have the most “yes” answers? Take that assessment and work from there. Again, no one is 100% an overachiever or an underachiever. Does One Type of Achiever Do Better at Working at Home Than the Other? It doesn’t appear that either one does better than the other because both need to be on the look out for things that could go wrong. If either one does not know how to identify their tendencies or weakness, either one could fail. You don’t have to be an overachiever or even an underachiever to work at home. You don’t have to be perfect, and you don’t have to wait until everything is perfect either. You just have to want it. You just have to get started. Great post Leisa. I’m definitely more of an overachiever… one of the keys for me to be successful has been to try and work a little bit on all my projects every week – for example I’ll work on my ebook a little bit, then the next day I’ll work on my work newsletter a little bit, then work on blog posts a little bit, etc. Thanks, Erica. Great idea. Sometimes just a little bit means eventually getting it done. Don’t you find that sometimes just starting the project is the biggest hurdle? Great post and ideas to help with everyone’s achieving levels! Have a great day by design..
Robert, you have a great day also and thank you! I am a definite underachiever. I feel like you have been spying on me. 🙂 I have been working on booking myself more fully to make it more difficult to allow too much free time. I have also been working on developing a more positive attitude towards criticism. Although, that has been a much harder goal to accomplish. I have only been working at home for about 8 months and I have seen consistent improvement. So, I’m not going to be too hard on myself yet. Trish, exactly! Don’t be so hard on yourself. List those tendencies and ways to improve them. Also, you want to have some free time to enjoy and reward yourself with it. That should also be a part of your schedule. Spying on you? 😉 LOL No, sometimes I am writing to myself to better understand this whole work-at-home world.